These solitary wasps are around 2” long and which makes them the largest wasp. They are usually yellow and black and hunt cicadas to eat, hence the name. Males cannot sting but will use intimidation to defend their nests. Females can sting but rarely do. They dig a nest about a foot down into the ground where they store paralyzed adult cicadas. 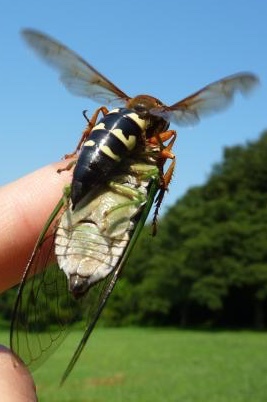 Eggs are laid on the cicadas and when they hatch larvae will eat it. The larvae will pupate to a cocoon and emerge the following spring. Adults are pollinators and eat nectar from flowering plants. Certain soils are more attractive to these wasps than others. They die off at the end of the summer when the cicadas are gone. People tend to be concerned about this wasp because of their size, but they are beneficial insects and usually do not need to be handled.